Our boho-style kid’s baskets are great for storage or for usage as a kid’s basket. It’s pretty, decorative and very practical. Use it as an alternative to your normal storage solution, or when you are at the beach for the kids, or on your next holiday. All baskets are woven by our artisans in Marrakech, using the palm tree leaf called ‘Abuda’, which Morocco has been famous in producing, and using them for their baskets. This material is very strong and resistant. In fact, the Moroccans have been using these handwoven baskets for many centuries, and are frequently used for any occasion. Whether it’s for shopping, storage, or for transportation (used on a donkey!). 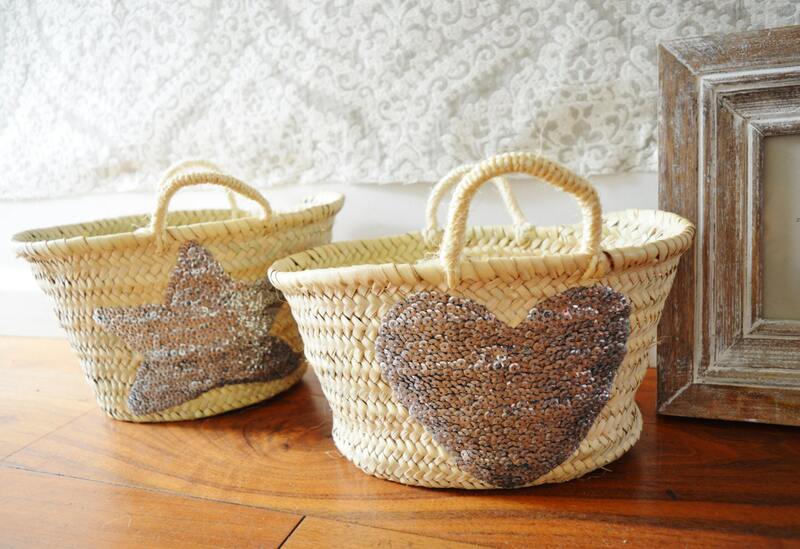 The usage of basket in Morocco is still very alive, and as it’s very eco-friendly, and ethical, we felt it is a brilliant idea to introduce these baskets into our modern style of life. Bring a part of Morocco into your everyday life, and be inspired…! We ship worldwide via Standard Mail. (Please note, we do have express options available). ♥・♥・♥・♥・♥・♥・♥・♥・♥・♥・♥・♥・♥・♥・♥・♥・♥・♥・♥・♥・♥・♥・♥・♥・♥・♥・♥・♥・♥・♥・♥・♥・♥・♥・♥・Our products are great for special occassions too: for halloween, Christmas, birthday, Ramadan, Eid and many more.., halloween. Perfect for Black Friday Sale, Christmas gifts, gifts, new year gifts. Great gifts ideas for Valentine's Day, Mother's day, Father's day too!Great as a Easter gift for your family and friends, and the upcoming Mother's day gifts.